Jinyuan Zhang is a PhD student in Finance, currently studying at INSEAD, Paris, France. Her current research interest lies in understanding the role of financial intermediaries in pricing assets. Prior the doctoral program, Jinyuan received MS in Statistics from the University of British Columbia. 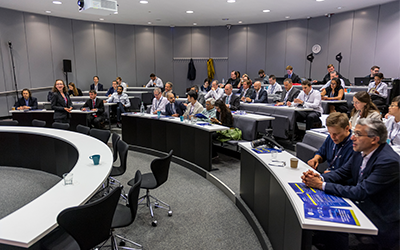 Jinyuan was the winner of this year’s Best Paper by a Young Researcher, presented by Nej D’Jelal, Head of Electronic Equites, EMEA, Barclays and Plato Partnership Co-Chair and Andrei Kirilenko, Director, Centre for Global Finance and Technology, Imperial Business School. 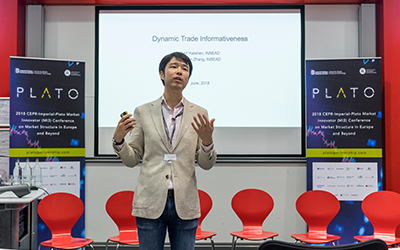 Dynamic Trade Informativeness sets out to develop a structural model to examine price dynamics. What makes this paper unique is that it allows trades’ permanent price impact is allowed to be time-varying – thus the ‘dynamic’ aspect of trade informativeness. Broadly speaking, a trade moves price in two ways: There is a permanent price impact and a transitory one. Trade informativeness can be time-varying, for a number of reasons. 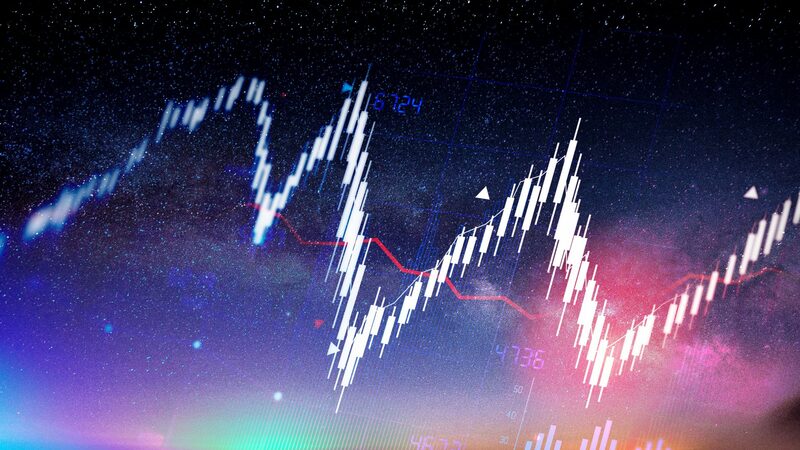 The amount of informed trading (relative to noise) might vary over trading hours, possibly due to investors coordination, time-varying volatility of noise trading, or intraday corporate events that either add to or resolve information asymmetry. Trade informativeness could be driven by informed investors’ strategic behaviour due to risk aversion, competition and learning, and discounting or random events. To construct the paper, Bart and Jinyuan used 300 randomly selected stocks from the S&P 1500 index over the year 2014 as the sample. Using this, they were able to estimate the structural model. Four applications were assessed to examine the usefulness of Bart and Jinyuan’s methodology. Examining the intraday pattern of trade informativeness by averaging across all the filtered intraday series of trade informativeness. Using this, the researchers found that trade informativeness decreases over the course of the day – with highest at the opening (20% above industry average) and lowest at the closing bell (10% below). This suggests adverse-selection is more severe in the morning. Examining the extent that filtered trade informativeness captures the permanent price impact should also hope to explain long-run future price returns. They can demonstrate that this is the case by comparing two nested regression models. 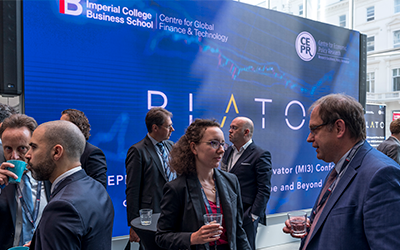 The researchers’ filtered dynamic trade informativeness can be used for intraday, high-frequency analysis to study the nature of intraday events and connections with investors’ behaviour. The researchers conducted an event study to examine the dynamics of trade informativeness which surrounded scheduled Fed announcements. They found that trade informativeness first picks up, but then plummets within the minute immediately before scheduled time. Filtered trade informativeness also identifies the informed side of each trade. If the efficient price is increased by the trade, the buyer is likely to be the more informed. Along this line, they designed a structural estimator for informed investors’ patience by counting the proportion of informed but passive trades. Applied earnings announcements, they find indeed that such patience drops significantly. Trade informativeness is time-varying in nature and, as such, empirically identified dynamic patterns can help assess theoretical models. Without a dynamic characterisation of trade informativeness, it is difficult to assess investor’s high-frequency trading behaviour – at normal times, and upon intraday events. Aggressiveness and informativeness no longer need to be aligned at all times, a structural measure of informed investors’ patience follows.